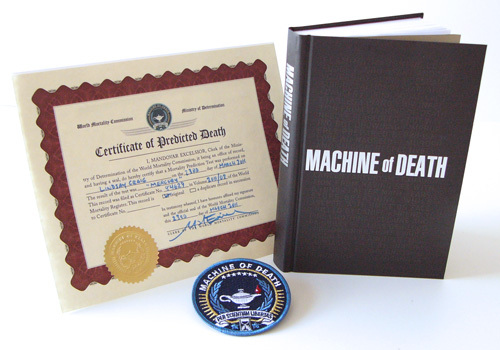 Machine of Death » Death cards, hardcovers, and a talent show! Events & merch 28 Mar 2011 04:38 pm by David ! Death cards, hardcovers, and a talent show! We decided to make some cool stuff. Go right from the inspiration — the vision — to actually making it. Don’t think it through. Don’t talk about it. Don’t plan it. Dive in and start making it happen. If you do that — if you can start rocking — you’ll get some momentum, and when you have some momentum then the project has a chance, because now you’re into it. I love this idea. I love it because it’s how I’ve always done my best work, the stuff that has a spark of spontaneity to it. 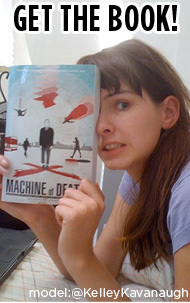 I admit to being incredibly intimidated by the scale of what’s going on with Machine of Death. I have tax paperwork on my desk right now for a company that I partially own that did not exist five months ago. We’ve passed far beyond what we’d ever thought was possible, so now it’s a matter of figuring out next steps — or all of a dozen different next steps. The tough part isn’t just keeping those dozen balls juggling in the air; it’s dealing with the perception that all of these balls are delicate rare eggs, and thus that any potential move has a million wrong moves for every right one. The danger of this fear is that the eggs, rather than being juggled, might instead be passed from hand to hand slowly and carefully, with a lot of questions and discussion and hand-wringing first, with plans extensively written to someday throw some eggs into the air… and meanwhile the eggs sit there spoiling while the plan is being written. This fear, this creeping, paralyzing fear, crawls into the back of my mind all the time. But the irony is that for all the energy spent on deliberation, everything that’s the least bit interesting about Machine of Death is the stuff that we’ve just decided to do. The Amazon campaign was conceived on a whim — heck, the entire book was conceived on a whim. The carefully plotted print-media publicity strategy, however — which involved more effort and money than I care to discuss — took many weeks longer to get off the ground than anticipated. And by the time it did, nobody in the media cared about a book that, at that point, had been out for months. Obviously there are a lot of factors involved, and the traditional media has a lot on its plate, and loads of books get overlooked in the best of circumstances. And who knows if it would have mattered anyway. The point is that, if you simply look at the stats, we have done far better by following whims than by executing carefully-planned strategies, for the simple reason that the strategies eat up time. Matt, Ryan and I love discussing ideas. And letting all the steam out of an idea by talking about it means it’s harder to ever do it. Energy that could be channeled into action sometimes gets channeled instead into hand-wringing. So we decided to just do some stuff. 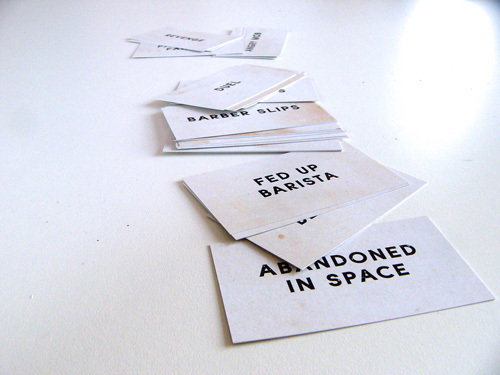 We now have a little money to play around with — not very much (we funneled most of our immediate profits back into printing more books), but since we all have other jobs and none of our mortgages are riding on this project, we want to play around a little, to buy ourselves a little adventure. Here’s what we’ve done. There are ninety-nine different ones. They all have a method of death printed on them. What are they useful for? I don’t know. Bookmarks? Scoop up dog poop off the sidewalk? Flash it to a cop to get out of a speeding ticket? The choice is yours. • Buy something from TopatoCo. Anything at all. You can buy a copy of our book, or something from Wondermark or Dinosaur Comics, or anything else at all. The cheery TopatoCo staff are dropping individual random cards into all orders, while supplies last. And all we ask is that you include something. A note, a poem, a drawing, a piece of grass from your town. If you’re not in the US and don’t have access to US postage, send a self-addressed envelope along with something worth about a dollar, and we’ll call it even. We just want to see something from you. Call it a trade. • Come see us in person. Anytime the official MOD blog or Facebook account mentions an appearance or signing, take it for granted that we’ll have death cards there to give away. If you can’t come in person, send a friend! 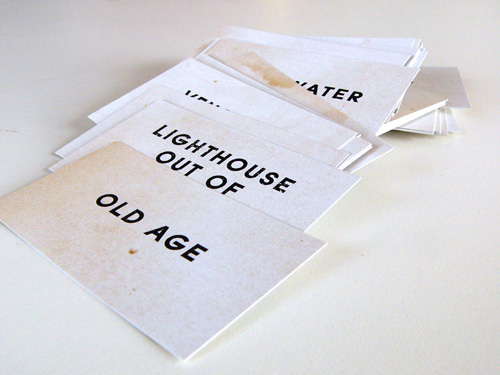 What are these cards good for? No idea. Why did we make them? Because it was cool. Speaking of cool! If you need a suggestion of something specific to buy from TopatoCo, this is our official answer. 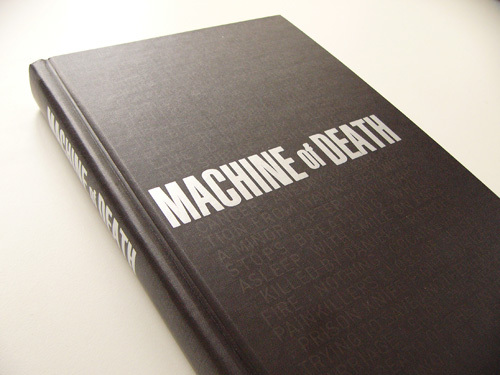 The Machine of Death Limited-Edition Hardcover has been printed in a strictly exclusive run of 300 copies. Update: which are all gone! The regular edition is still available though! The title is impressed with die-cut silver foil on the spine and cover, and all the titles of all the stories are printed subtly on the cover as well. 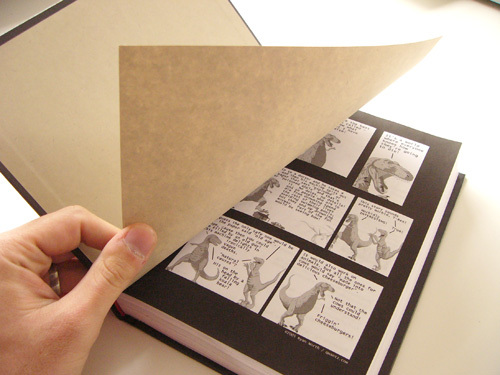 The book has no other exterior text or branding. 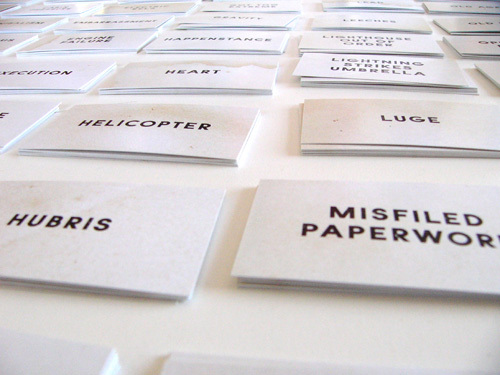 Every copy will be hand-numbered on the title page. I personally have worked super hard on this book, obsessing over details like choosing the paper stock for the endpapers (FiberMark Multicolor® Espresso) to the color of the stitching of the internal spine (Blaze Red). 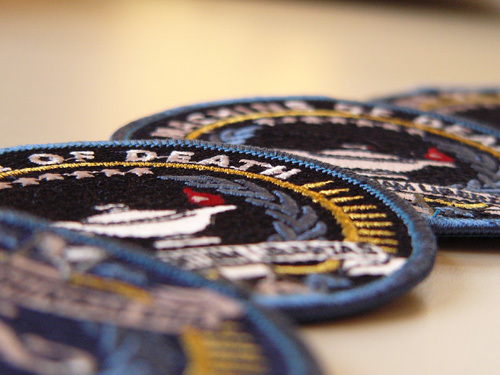 And because of the limited nature of this edition, we wanted to package it with something else special and unique — so I designed both a customizable Certificate of Predicted Death and an embroidered patch with a Machine of Death logo. 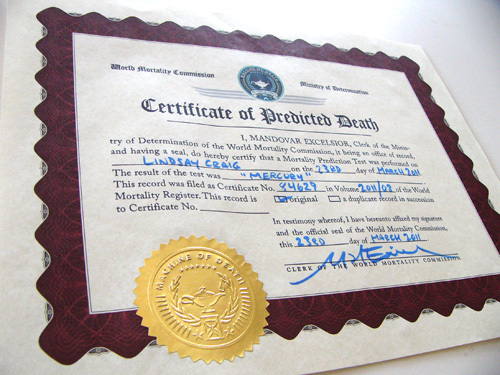 The seals on the certificate are created with a custom embosser. Why did I make a custom embosser with the MOD logo? I couldn’t honestly think of a reason not to. All three of these items — the numbered hardcover, the patch, and a customized certificate made out in your name — are bundled together as the MOD Collector’s Set. They’ll only be available while supplies last. So if you think these things are as cool as we do, you should buy them while you can! Update: They’re all gone! The regular edition is still available though! Machine of Death Collector’s Set: Available right now at TopatoCo Sold out! Another thing I wanted to do was put on a show! We never had a real “release party” of any sort with MOD, because its release was so internet-centered — I guess you could call October 26 the Virtual Release Party. It was plenty fun, don’t get me wrong! But I got it into my head to do something more tangible, something with a stage and an audience and, I don’t know, snacks. So I’m going to! On April 26, 2011, we’ll be celebrating MOD’s six-month birthday with a party and live comedy show. The show will be held in Los Angeles and will be free to attend. It will also be streamed live online, so everyone around the world can watch and participate live on Twitter. 1. A live reading from MOD by Semi-Famous Person ????? 2. A game of MOD Pictionary featuring audience volunteers playing with Celebrity Cartoonists ????? and ????? 3. A comedy performance by Famed Improv-Troupe ????? 4. A talent show featuring you! Prizes will be awarded! 5. Multiple contributors will be in attendance to sign your books! 6. Finally, we’ll close out the night with ???? ?, in which everybody present will go home with a ????? • If you want to perform live, you must be willing to come to Los Angeles. Otherwise, we can show a video. Send your audition (which, if you can’t attend in L.A., will be the video we show) to: submit at machineofdeath dot net. A link to YouTube or Vimeo or something is fine. Video is strongly preferred, but audio is okay if it’s a song or reading or something audio-only. Submissions that do not include a video or audio clip will not be considered. Why submit an audition? Well, we’ll be putting you on stage, in front of tons of other people and the internet, endorsing you with our brand, and if you’re really good we’ll ask you to be part of our regular lineup as we put together future shows. Plus the audience will vote on prizes to be awarded to all performers! It’s gonna be pretty cool. The deadline for submitting an audition is April 18. That’s not very long! Get going! All $5.99, from now till April 26. So, if you have friends who’d be great on stage at our show, point them our way! We’d love to consider their audition. And finally — thank you. So we’re doing our part, the first part. We aren’t done yet, not by a long shot. But this is a first salvo. Hope you like it all. 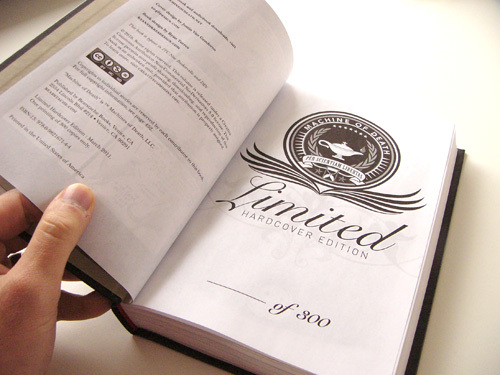 If someone buys the hard cover special edition, will you tell them ahead of time what their edition number will be? Sorry, there is no way to choose which number you get! They’re sent out sequentially as the orders are received. You can put a note to TopatoCo in the Special Instructions box at checkout, but this is in no way any sort of guarantee. Will the live steam be available to watch at a later date? DM: The video will be archived for watching later, yes! Oh no. You’ve made the machine of death! I’m slightly confused. Where do you send in the auditions for the talent show? Pardon! I didn’t see the address before. In Alaska we are silly and overlook things. If I want to go the SASA route, could I get two MOD cards (one for me & my partner), or do I need to send two SASAs? DM: That’s fine! We’d love one item from you in exchange for each card we send, but we can send a couple cards back to you in the same SASE. Would you consider selling the patches separately? DM: We’ll see how many we have left afterwards! I don’t see why we couldn’t, but it depends on the stock left. I am impressed by your abilities to make ownership of a physical book and not just the information it contains worth paying $50. How big are the cards? Are we talking business card sized, or larger? I’m planning on sending an envelope for one and I just want to be sure that the card will fit. DM: A regular letter-sized envelope works fine! Looks like the hardcover already sold out! My copy is #061, and I die in a “blaze”! Just need to get a good mat cut for the certificate. So that’s what the countdown was to!